Blinding Flash is a Defensive Monk skill unlocked at Level 4. The Monk blinds his enemies with a flash of light. The Monk expends spirit energy to create a flash of light which blinds his enemies, preventing them from attacking unless attacked first. This skill first appeared at BlizzCon 2010; in the demo, it was one of the skills the Monk already had points in. The Monk sends out a fast sphere of light which blinds nearby enemies, marking them with a special sign which appears above them. Quite likely you’ll want some of the defensive skills for very special occasions. This one sounds like it would help against a really nasty boss pack, or against a bunch of ranged attackers. And the defensive skills will probably be very useful later in the game; just not so much early on, as powerful as the Monk is in his killing techniques. Skill tiers were removed shortly before the beta started in September 2011, and Blinding Flash became a level 1 skill. 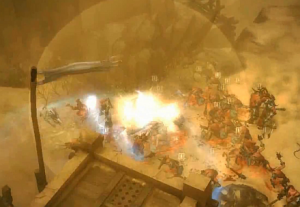 The skill system was once again overhauled for the Beta Patch 13 in February 2012, and Blinding Flash was classified as a Defensive skill and moved to level 4. Blinding Flash in the desert. This page was last edited on 15 April 2015, at 13:57.